Once again I am posting a few songs of my choice, this time all in Raga Khamaj. 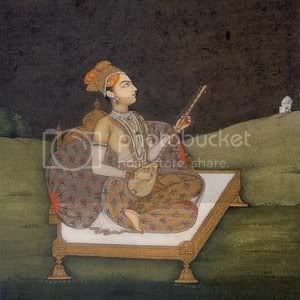 For the uninitiated, Raga Khamaj is a late evening Raga usually sung in the light Thumri style. QUIZ : Give me the names of the male and female singers and the name of the Album/Film, and I will send you this rare song + a bestseller e-book (in Microsoft Reader .lit format) by email. Answer the questions in the comments to this post, and please don’t forget to mention your email address. P.S : Did anyone notice the new addition in the ‘WHAT’S HOT‘ section of the sidebar. I just finished compiling a book out of posts on the now ‘infamous’ ‘FAKE IPL PLAYER’ blog (I love compiling e-books), and thought to share it with you. It’s insanely hilarious. You must have Microsoft Reader installed to be able to read it. 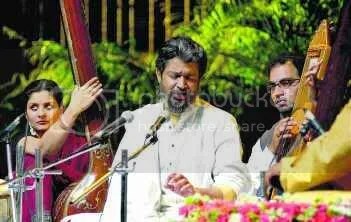 He was once pitched as one of India’s potential classical music stars. But Kumar Gandharva’s son has now been found suffering from depression and crooning for booze. Classical singer Mukul Shivputra, 54, was spotted sitting on the road outside a temple, begging for money so that he could buy his next drink. On May 7, Mukul Shivputra, unwashed and dishevelled, was seen begging for money to buy booze outside a Sai Baba temple in Bhopal. When a passerby recognised him, he managed to flee the spot and remained untraced for the next five days. Soon after hearing the news, Madhya Pradesh chief minister Shivraj Singh Chauhan asked the culture department and the police to locate the singer. For five days, culture department officials and the cops searched for Mukul at several places, including temples in Bhopal. A team was rushed to Dewas, near Indore, where Mukul owns a house, then Nemawar and thereafter Jalgaon. The team however, returned empty handed. On May 12, a journalist saw him at the Hoshangabad railway station and informed the secretary, culture department. Officials found Mukul Shivputra suffering from dehydration. When the culture department contacted the singer’s family, they refused to take him back home. “He isn’t begging because he is poor. He’s mentally unstable“, said a Bhopal based family source. “Having gone through a lot of mental stress, he took to alcohol and drugs. Mysterious disappearances have been quite normal with him. His family members parted ways with him because he splurged on drugs and alcohol even using debit and credit cards“. Source : The Times of India, 15th May, 2009. With the passing away of Siddheshwari Devi in 1977, the last of the four great divas of the last century was gone. 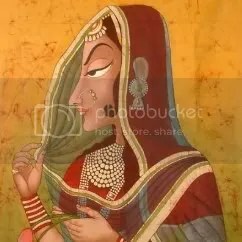 First went Begum Akhtar in 1974, and then her older contemporaries, Rasoolan Bai and Badi Moti Bai. All four of them were inheritors of great traditions of music from a glorious era of the past when music dominated the lives of musicians from childhood to death. They were musical ‘stars’ who shone brilliantly in the courtly era, but when the ‘darbari‘ era ended they did not hesitate to step out into the glare of public acclaim. Thumris were once sung with abhinaya. When classical purists began to frown down upon this type of music, all the four singers took to the Bol-Banav-Ki Thumri in which the emotional contents of songs are effectively brought out through vocal expression only, through the beauty of notes, voice modulations and swara combinations, resulting in an emotion-charged style of singing. I will give you the correct answer in one of my later posts.